The picture is taken in front of the Native American Museum near Battery park in NYC. 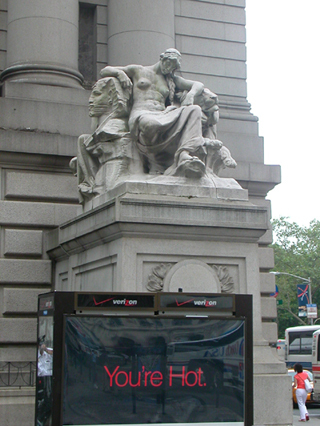 The statue when seen from a different angle with the Verizon billboard in the foreground presented a twisted humor and I couldn't help catching the moment in my picture. What a great capture. I think a lot of the pictures from this challenge ended up being nicely caught pictures from every day life, and that's great. The irony in this is great, the "you're hot" comment under the statue. Well, first of all, the picture is a bit small! I think you probably got reduced points for that from people. That doesn't bother me, because it is still big enough to convey the message across. Personally, I would have cropped a bit more of the picture. Namely the stuff to the right of the building. The bright light removes the focus from the statue and billboard advertisement. I would have also tried to straighten the horizon a bit. All in all a fun shot that you seemed to at least have fun with yourself. Good capture, and good luck in the following challengeS! Thanks a lot for you comments everybody. Actually I kept the right side intentionally, to show the surroundings and give a flavor of the moment...anyway. Thanx again. Good concept, sharp photo, but the people and buses on the side are distracting. Would a tighter crop have improved it? THIS IS GREAT IRONY! Extra points for actually shooting Irony and not just a staged oxymoron! It's nice and clear. I would have rather not seen the traffic and lady but oh well. Nice job. I like the irony on your picture, I was looking something like this for this challange. May be it can be taken bit more close, then I can see a face of sculpture and do not see living people on the right side, but i will give you 10, only because of the idea. Good capture, I like the lighting, good colors. I don't get the title...? I do see the irony of the statue and the sign. I guess the biggest draw back here is the crop. The bottom is not straight. Still you found something!! This was a hard challenge. Proudly hosted by Sargasso Networks. Current Server Time: 04/19/2019 08:18:41 AM EDT.